This set of Power Electronics Multiple Choice Questions & Answers (MCQs) for campus interviews focuses on “Single-Phase FW AC-DC-5”. 1. 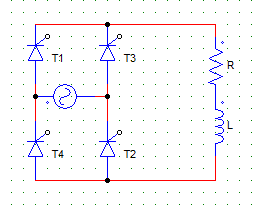 In the circuit shown below, find the expression of average output voltage if due to some faults the SCR T3 gets permanently open circuited. 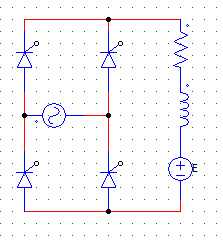 Explanation: If one of the device gets O.C the circuit would behave just like a half-wave rectifier. Only Two SCRs T1 & T2 will operate, even T4 is useless in this case. Vo = 1/2π x [ ∫ Vm sinωt d(ωt) ] where the integration would run from α to π+α. 2. A single phase full converter, feeds power to a RLE load with R = 6 Ω and E = 60 V. The supply voltage is 230 V AC and the firing angle is 50°. Find the power delivered to the battery. Power delivered = E x I = 60 x 12.181 = 730.86 Watts. Explanation: FD does not come into the picture for resistive loads. 5. A single phase full converter has average & peak voltage values of 133 V and 325 V respectively. Find the value of the firing angle. Vo = 2Vm/π cosα = 133 V.
Explanation: FD improves efficiency by providing freewheeling action which increase the power delivered to the load. Explanation: As the load is RLE output voltage will always exists even if the current goes to zero due to E.
Explanation: The current falls to zero when the L has discharged completely and the devices are not yet fired. Explanation: For inverter operation the firing angle should be above 180 and E should be reversed. Explanation: If diodes are put in place of any 3 SCRs the conduction angle would increase and hence the voltage. 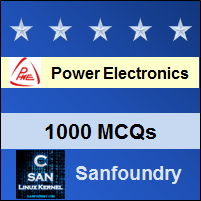 To practice all areas of Power Electronics for campus interviews, here is complete set of 1000+ Multiple Choice Questions and Answers.